The iconic Captain Volt shares his super-expert advice. It happens to the best of us. You’re dashing off to work or an appointment… you turn the ignition key on and well, your car won’t start. Frustration immediately kicks in. You’ve guessed right– your vehicle has a flat battery! When your battery fails your vehicle won’t start, sometimes leaving you stranded in the middle of nowhere. So why take chances? 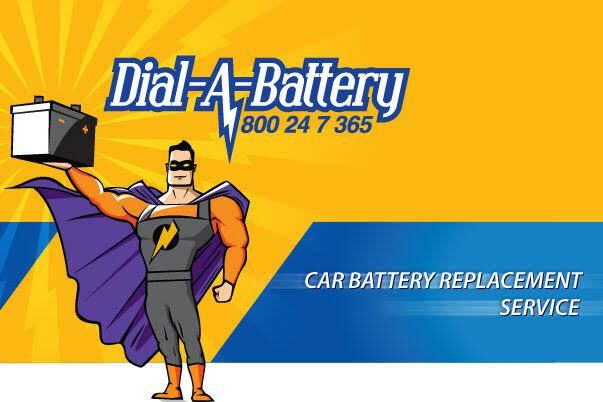 Call Dial-A-Battery for a free battery testing service for cars, SUVs or light trucks. One of our professional technicians will give your battery a properhealth check and advice on repairs or a replacement, so there is no downtime and you are back on the road without delay. “It is vital that you keep the battery clamped tightly to the tray using the clamping arrangement provided. This prevents it from vibration, jumping or jiggling. A loose battery will spill acid, damage plates and other active parts inside. Also ensure to not fit an oversized battery on the tray in a tilted manner as it can lead to acid spills,” Captain Volt added. As experts in the business, Dial-A-Battery believes it is better to be safe than sorry and offers its advice freely. For example, not storing batteries in hot places and refraining from removing the heat shield as it protects and improves the life of the battery. Batteries should be treated with utmost precaution and the use of protective gloves and safety glasses when handling are highly recommended. Dial-A-Battery has more valuable tips to offer in the interest of both the driver and the vehicle. For example, it is recommended that you use only white petroleum jelly or Vaseline to protect your battery terminals from corrosion. Motorists are advised to never apply grease on battery terminals as they can catch fire in the case of a loose connection or sparking. “I also tell my customers to keep an eye on the Magic Eye. The “White Magic Eye” means your battery needs to be revived by re-charging. In cases where the battery has “Red Magic Eye” the motorist needs to replace the battery immediately,” Technician Ramel continued. In keeping with its commitment to the automobile industry in the Emirates, Dial-A-Battery is happy to share more useful advice. Motorists can call 800 24 7 365 to speak to a technician or use the friendly online chat service. Dial-A-Battery is the one source solution for batteries. All diagnostics are conducted on-site thus saving motorists all the trouble of having their vehicle towed or taken to workshops. The company stocks large range of SOLITE, Bosch & ACDELCO batteries and is equipped with state-of-the-art computerized systems that save the motorist valuable time and money.